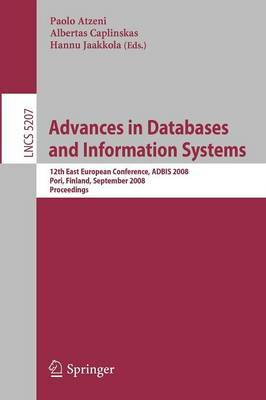 This volume contains the best papers presented at the 12th East-European Conference on Advances in Databases and Information Systems (ADBIS 2008) held during S- tember 5-9, 2008, in Pori, Finland. The series of ADBIS conferences is the successor of the annual international workshops with the same title that during 1993-1996 were organized in Russia by the Moscow ACM SIGMOD Chapter. ADBIS 2008 continues the series of ADBIS conferences held in St. Petersburg, Russia (1997), Poznan, Poland (1998), Maribor, Slovenia (1999), Prague, Czech Republic (2000), Vilnius, Lithuania (2001), Bratislava, Slovakia (2002), Dresden, Germany (2003), Budapest, Hungary (2004), Tallinn, Estonia (2005), Thessaloniki, Greece (2006), and Varna, Bulgaria (2007). The conferences are initiated and supervised by an international Steering Committee chaired by professor Leonid Kalinichenko. The ADBIS conferences established an outstanding reputation as a scientific event of high quality serving as an internationally highly visible showcase for research achie- ments in the field of databases and information systems. ADBIS 2008 aimed to create conditions for experienced researchers to impart their knowledge and experience to the young researchers at pre- or post-doctoral level, and to promote interaction and colla- ration between European research communities (especially from Central and East Europe) and the rest of the world. The conference encourages contacts between the p- ticipants who are nationals of, but active outside, the Member States and Associated States and their colleagues in Member States and Associated States. Special attention is paid to collaboration of researchers in Central and East Europe.